RIDLEY TOWNSHIP — It’s not often the owners of a local gutter business accept jobs more than 40 minutes away, but last month, Brian and Michael DeHart made an exception. Customer Mary Kay Church was nine months pregnant and her husband, a Marine captain, was serving in Iraq. Her gutters were in dire need of repair, but Church couldn’t afford the estimates of other companies near her home in the Wayne section of Radnor Township. The DeHarts’ Folsom-based business, The Gutter Brothers, answered Church’s call for help — for free. "What else could I do?" Brian DeHart asked. "We show up and this lady looks like she’s going to pop; she was just a few weeks away from having her baby, and her husband was overseas. "It is our civic duty to take care of this woman in her time of need." The Gutter Brothers spent the day working on a $500 job, installing downspouts and repairing and cleaning her home’s existing gutters. Then, when Church expected a bill, DeHart flashed a smile instead. He turned her money away, without expecting anything in return. What surprises Church even now is DeHart doesn’t seem to understand why she is so grateful for his kindness. "What did we do? We gave (Church) a $500 gutter repair for free. It’s no big deal — we installed a couple of downspouts and repaired and cleaned some gutters. It’s something we do on a daily basis," DeHart said. "Her appreciation is worth more than $10,000. It’s priceless." Church wanted to give The Gutter Brothers more than just her appreciation. She told her husband about the company’s kind deed and set into motion events that would make DeHart cherish his trip to Radnor Township forever. About one week after repairing Church’s gutters, DeHart said he received a letter from her husband and the military, thanking him for the generosity he showed the Church family. Enclosed was a commemorative Marine Corps gold coin, which he gave to one of his employees that worked on the job. But what seemed to evoke the most emotion from DeHart was an American flag Church’s husband sent from Iraq, wrapped in a certificate of authenticity. The flag was flown in Iraq and signed by all of Church’s commanding officers. An attached photograph of the flag flying in Iraq during Operation Iraqi Freedom is something DeHart said he would never forget. Church’s token of appreciation now hangs in The Gutter Brothers’ office at the company’s showroom on Kedron Avenue (Route 420), next to the Marine Corps Training Center in Folsom, Ridley Township. DeHart said he hasn’t figured out where he would display the flag and picture permanently; something that precious deserves the perfect spot. "Three thousand people have died in Iraq and we get a flag flown for us for putting up a gutter on a house," he said. "It is amazing to have this flag. we are honored." 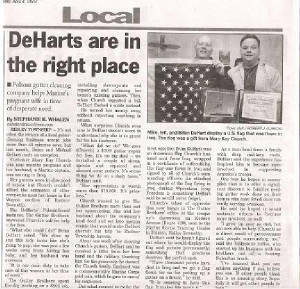 As a man bred from a family with deep military roots, DeHart said the experience has inspired him to become more involved in supporting America’s troops. One way he hopes to accomplish that is to offer a significant discount to families needing gutter work done on their homes who have loved ones currently serving overseas. He said he hoped it would motivate others to become more involved, as well. "I grew up poor , but am now able to help (Church) as a direct result of perseverance and people surrounding me," said the Eddystone native, who started up his business with his brother out of a beat-up old Suburban truck. "I’ve learned that you can achieve anything if you believe you can. If other people think this is an amazing story, hopefully it will get other people to help."